Squash House Quilts: Crazy 8 Strip Teaser Table Topper! No...that's not me in the title - but I got you going, didn't I! Yesterday I finished my second of two classes at my LQS on this fun project by the gals that call themselves "The 3/4 Crazies" out of Lake Havasu City, AZ! During class we were trying to figure out how they came up with this idea - we figured they might have had one glass of wine too many one evening! Whatever the case, this is one crazy pattern that comes together so surprisingly well! Here you see my flimsy below - I used Gobble Gobble by Sandy Gervais - it fits perfectly on our round kitchen table! Now I just need to cut the bias binding and get it quilted for fall decorating! I think one of my Magic Lantern pumpkins will look great on it - providing they mature in time! I sprayed too much liquid fertilizer on them the other day and managed to kill the smaller ones, but there are four that are quite large and I think will make it! 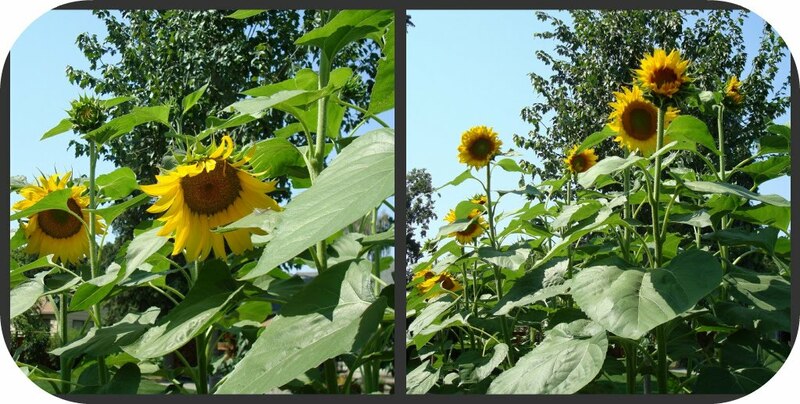 Speaking of the garden, check out my sunflowers! They are finally opening - albeit to the alley - I guess that's the way they want to follow the sun from the east to the west. Mr. Squash said he thinks they're snubbing us - lol!! I harvested all but a few smaller carrots the other day! Look at the bounty combined with that days green bean harvest! Beans are harvested almost daily right now! I plan to make carrot cake, lots of pot roast (our favorite) and use the rest for just plain munching! This was my first tomato harvest about a week ago. Since then I've gotten two more large tomatoes and quite a few more cherry tomatoes. Everyone in town has remarked that it hasn't been the best year for tomatoes. But most of my bushes are loaded - I think we just need to be patient for them to ripen! I also cleaned out the lettuce bed - we couldn't eat or give it away fast enough before a lot of it bolted. I re-planted four more rows for a later summer harvest. While I was pulling the bolted plants, this cute little while Petunia emerged hidden in the lettuce leaves! What a brave little soul! I left her in hopes that she will produce babies and keep the Marigolds company while the new lettuce sprouts! Oh, Candace, how "Fun and Fall" your tabletopper is !! I am such a huge fan of Gobble Gobble and the pattern you have chosen to use it in is wonderful ! Too funny, this is the third time now within a couple weeks that I've seen this pattern. They were classes offered at different quilt shops. We've been pulling out yellow summer squash, zuchini and smaller tomatoes every 3-ish days right now. And our pumpkin vines are going wild! Your tabletopper is fantastic and perfect for a round table. Not only would a pumpkin look gorgeous sitting there but also a vase of sunflowers! Gorgeous veggies fresh from the garden. Next thing I know you'll be setting up "Squash House Bounty" fresh veggie stand. I love your tabletopper. Maybe later, a pumpkin pie right smack in the middle would look nice. Wonderful post today, love that table topper! Looks so complex, you'll have admiration of all who see it! Your bounty is amazing. The slugs have and continue to eat everything in my yard. I'm glad others are able to eat from their gardens. Wow, what an incredible looking top. The pumpkins will be so wonderful on it. Beautiful veggies and sunflowers from your garden :)The petunia is so sweet! Your table topper looks great. Is it as complicated as it looks. I love Gobble Gobble - it's perfect for fall! Your garden is producing wonderfully! I am still finding lots to do with zucchini...just made zucchini relish and it is great. Speaking of great...your table topper is great! I couldn't stop studying it. Also Great choice of fabrics! Your table topper is too cute. That really does look complicated. And the fabrics look so wonderful. I enjoyed your harvest report. Your garden is just amazing. My tomatoes did so-so, but then the mockingbirds started dive-bombing them. Along with the blueberries and figs! That is one awesome table topper, Candace. I just love the colors and it makes me realize that I`m sooooo ready for fall after all this stifling heat we`ve been having. Everything from your garden looks so luscious and yummy. There is a farmer not too far from us who plants a huge field of sunflowers. When you drive by at different times of the day, the heads are turned in a different direction, following the sun. Isn`t nature grand? Hi Candace.....love the fabrics you used for your topper. I was at a quilt retreat over the weekend and made one out of Xmas fabrics...now I'm a bit nervous about putting the binding on. How did they suggest you handle those dips? Great blog :-)!!!! Oh, your table topper is so pretty. Love the fabrics you used. And check out your harvest. Wow! Lots of good things to eat. Love the table topper Candace! You're right, it would look awesome with Kat and Jax. 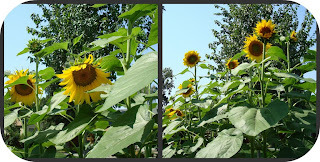 We planted sunflowers that we bought at a farmer's market, but they were short, maybe about two feet, and never got any bigger, and then they withered up and went away. :( Are sunflowers suppose to do that? They only lasted about two weeks. I'd really like to plant the larger ones next year, if I can figure out where to get them. Your garden looks wonderful! Our tomatoes are doing great, as are our chili and bell peppers, basil, eggplant, and other assorted herbs, but our beans, cucumbers, squash and pumpkins are a bust. Don't know what we did wrong. I guess it's all trial and error. Hoping for better growing next season. Love the table topper in autumn colors. I made it in reds and whites for Valentine's Day and it is beautiful. I am envious of your garden. Too hot in Phoenix for the crop you have going.